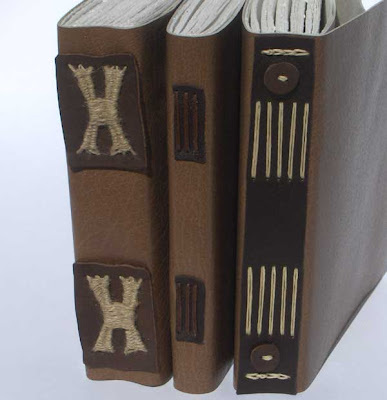 Inspired by a photo, I attempted to do a sample of each Langstichheftung (longstitch) binding style descriped by Szirmai. The three different structures he describes (in my photo, left to right) are the archival sewing, and the independent longstitch sewing, and the all-along sewing with change-over chain stitch. 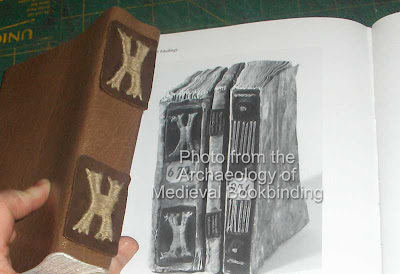 These structures seem to be typical of the medieval limp leather bindings. Here's the photo that I started with. My attempt at the extra interwoven sewing created a rather thick and bulky pattern in comparison, but perhaps mine will look more similar after 400 years! 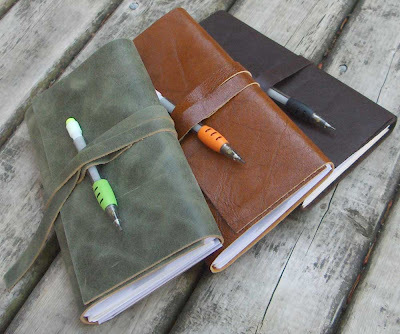 For the third year, I'm going to make some Weekly Planners to sell. My 2007 weekly planners were many different styles but last year I made the 2008 planners almost all the same - and used the longstitch through a slotted cover for most of them. So I recently got some 2009 planner inserts - and I really like them; they have a 2-page spread for each week, lots of room for writing things each day. Also lots of pages for personal info, phone numbers, etc. Nice paper too. And I've added pocket pages and lots of blank pages as well - this is the type of planner I like - lots of pages to fill - but not too big. I decided to try something fun with these ones, and devised a sewing pattern to get 2009 on the spine. And I did a few without the digits, using a plain longstitch, then adding a little pen loop on the front, which might be handy for some people. I love making these. 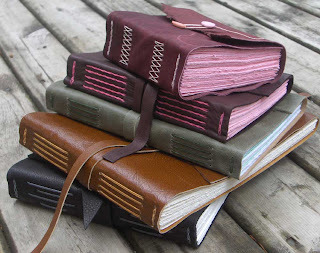 They are small hardcover journals with 100 pages (50 sheets) of mixed papers. 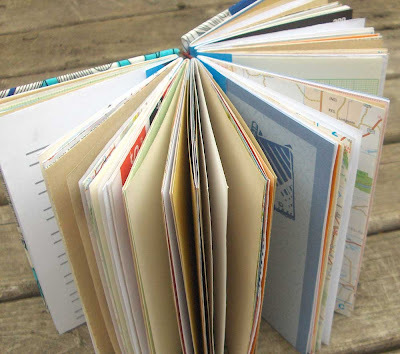 Pages are a variety of handmade, textured, vellum, printed, recycled, lined, and plain papers in various colours. 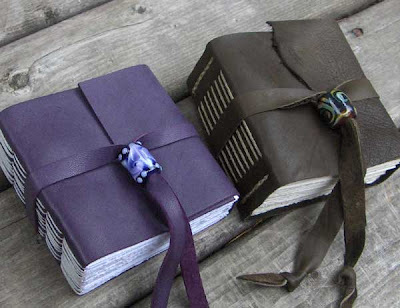 The purple book has my own hand marbled paper on the covers! 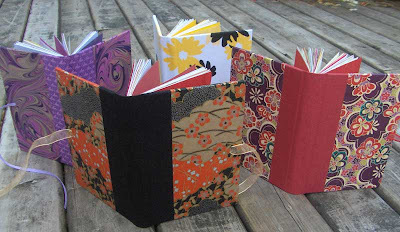 There is Japanese Chiyogami used with the red spine and the black spine, and the yellow book is done in full cloth. 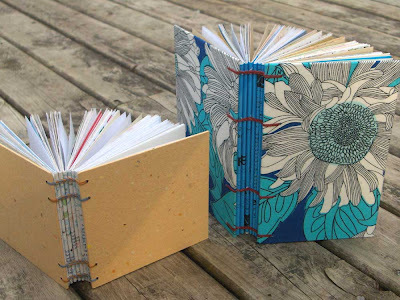 I used scrap materials to make these books - everything was destined to be landfill (with two small exceptions). I used scraps of mat board to make the covers. 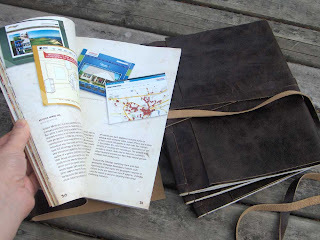 The peach book has my handmade paper on the covers - which was made from paper scraps. For the blue book, I used a fabric remnant to make some book cloth for the cover (exception number one: the cloth was backed with mulberry paper and the mulberry paper was new). 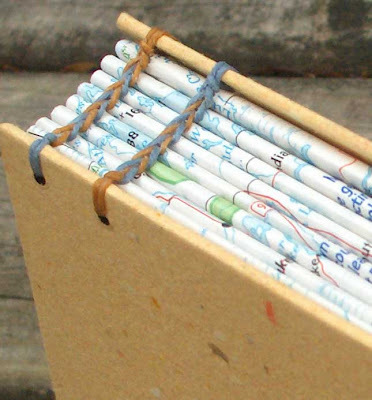 The paper used for the pages in these books, all came from the scrap box. So a lot of the pages have some printing or images on one side. The pages are a mix of some blank papers cut off from larger projects, graph paper and lined paper from old notebooks, as well as pieces cut from old maps, card stock scraps, old photocopies, misprints from the computer printer, notebook covers, paper cut down from large envelopes, etc. 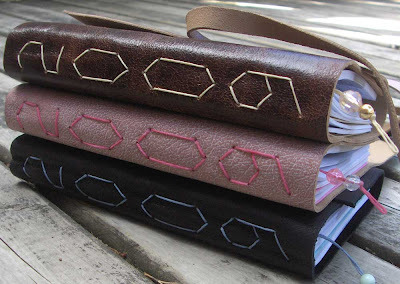 Both books are bound using an exposed chain stitch sewing - four needles for four rows of chain stitches. I believe this is the Ethiopian style of chain stitch (rather than Coptic, which is the one-needle style...please correct me if I'm wrong on this). I used two colours on the peach book to get the fun stripy thing happening (exception number two: the linen thread was new). Both books are available on Etsy. 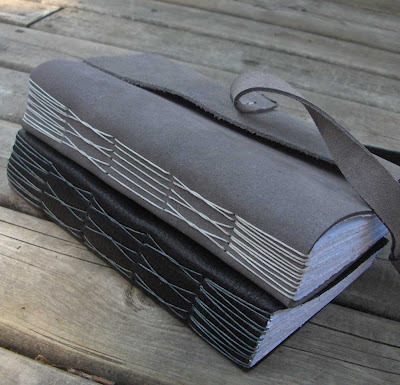 The Bookbinding Etsy Street Team is having a Back to School Sale this weekend! So, August 8th-10th you can get FREE SHIPPING in my Etsy shop. 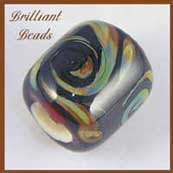 There are over 20 other shops participating in this event; you can see the full list of shops over on the BEST Blog. I've been busy again and neglecting my blog a bit, oops. So I should try to fill in the gap by showing some of the things I've been doing. I tried a few new things and finally used a bit of my Suminagashi paper that I made back in May. 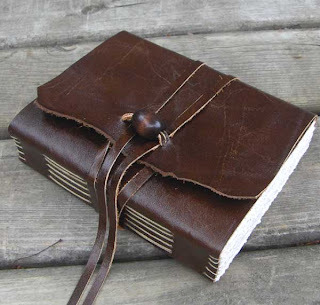 This is a limp leather book, but unlike most of the leather books I make, this one has no visible stitching. The textblock is sewn on tapes and it is backed and "cased in" similar to if it had an actual case...if that makes sense. I had a couple recent orders for custom albums. This one is for a wedding and it's quite big, about 16" wide. I used Dupioni silk on the covers. Then there was this half dozen documents that I bound for a local design company - the document was a response to a big rfp and I think they got the deal, yay! This was a double experiment. I played around with the basic longstitch here, and then tried a different strap closure as well. Phew. That's all for now!